How will news be driven in this new Administration? Take a look here. 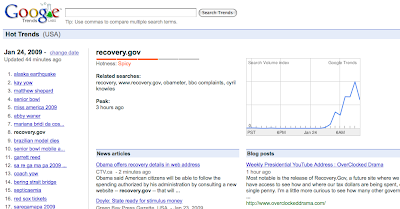 President Obama, in his weekly video address spoke about a new "under construction" website called recovery.gov. 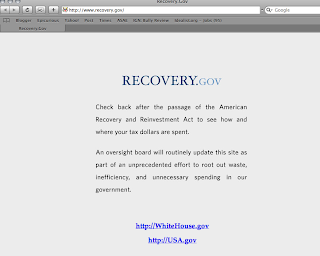 Now, there isn't a recovery.gov site, outside of a placeholder. But that placeholder is receiving traffic. And bloggers are blogging it, reporters are reporting it. This means that there are multiple references to the site, so it will have good search engine placement. This administration is providing one case-study after another in harnessing the power of multi-channel communications. While most agencies do not have the reach of the White House and President Obama, these techniques can be used on a smaller scale to broadcast messages to specific audiences and stakeholders. Start by tracking usage from day one. You won't know how far you have come if you don't know where you started. First day, zero. Figure out how to use current tools, like email and your current website, to drive your audience. Be consistent in your efforts. People need to learn to count on your information. This is a long-term process.